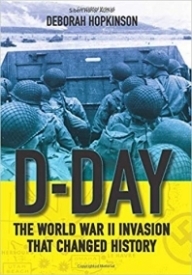 The WWII invasion known as D-Day was the largest military endeavor in history. By June 6, 1944, Hitler and his allies had a strong grip on the European continent, where Nazi Germany was engaged in the mass extermination of the Jewish people. The goal of D-Day was the total defeat of Hitler's regime, and the defense of free democracies everywhere. Knowing they had to breach the French coast, the US, Great Britain, and Canada planned for the impossible. D-Day was an invasion not for conquest, but liberation, and required years to plan and total secrecy to keep the advantage of surprise. Once deployed, Operation Overlord involved soldiers, sailors, paratroopers, and specialists. Acclaimed author Deborah Hopkinson weaves together the contributions of not only D-Day's famous players, but African Americans, women, journalists, and service members in a masterful tapestry of official documents, personal narratives, and archival photos to bring this decisive battle to vivid, thrilling life.